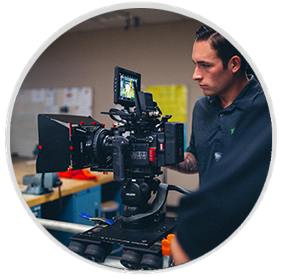 From script to screen, video to animation, and everything in-between, we are a full service video production company. NextThought Studios is a leader among video production companies across the United States. We create award-winning videos for education, marketing, training & HR, and more. What can NextThought Studios do for you? Animated films aren’t just for kids anymore — now, they're essential tools anyone can use for training and marketing videos alike. Whether we’re enjoying our nightly TV show or gathered around the screen for the big game, commercials have become an expected, and sometimes celebrated, part of American entertainment. Corporate training video production can make your onboarding and continuing education process easier, more affordable and more engaging for your team members. Storytelling is a fine art, and nowhere is that more on display than in today’s documentary films. Drone video services can provide a bird’s eye view of what matters most to you. Delivering quality instructional videos for universities around the country is what has allowed us to become the national leader in educational video production. Interactive videos are like "choose your adventure" storybooks. It allows your audience to choose their content and arrive to the training or products they need faster. Time lapse video allows you to show a progressive sequence of events and keep your video under two minutes long— the preferred length for viewer engagement. NextThought Studios provides white label video production services to agencies across the United States. We tell your best story. Your business deserves a special voice that highlights your unique strengths, team and offerings. Let us bring your vision to life with a video that will engage and excite your audience. Tell your story and meet your customers, students, and employees where they are with NextThought Studios. Our expert team of 19 producers, directors, editors, designers, animators and engineers can deliver an interactive visual experience that takes you through the entire video production process, from sketching and storyboarding to finishing touches that highlight your company’s core values. We’ll remove the worry of investing in digital by delivering a high-quality project that exceeds your standards. The concepts we’ve energized and emboldened to improve sales, information retention and strength of brand speak for themselves. Looking for some inspiration for your next video project? Check out our portfolio. and receive a quote for your next video production instantly. Looking to get started on your next video project? Let's talk. We deliver a commitment to quality that you and your audience will notice. If you’re ready for a change to your video presence fill out the form or call 405-689-5486 to contact NextThought Studios today.